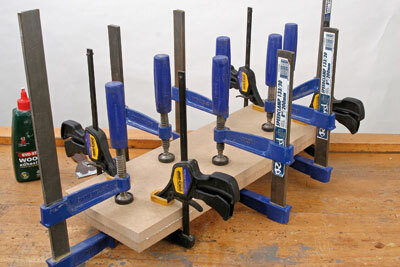 If you are remotely serious about woodworking you will need a varied selection of clamps, or more correctly, cramps. The two terms seem to be used synonymously these days and I think the older you are the more likely you are to call them cramps; I tend to use both terms in equal measure but please don't write in and correct me! Without doubt cramps can make or break a job, not just in pulling it all together at the assembly stage, but also in acting as a third hand when you are trying to hold the work for further attention. Over time you will build up quite an assortment of the different types and I think it is fair to say that you cannot have too many. 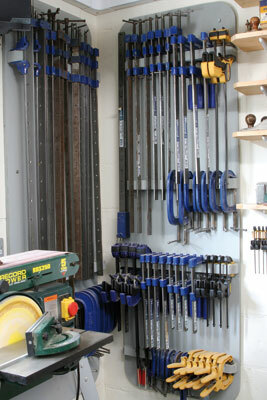 A large part of my workshop is devoted to clamp storage, photo 1. However, equipping yourself with a workshop full of good-quality cramps is an expensive exercise, and there are so many different styles and sizes on offer that the choice can be bewildering, photo 2. This is a brief overview of the most common types. 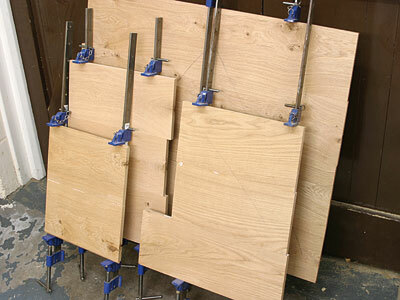 Any sort of panel work, when you are gluing up narrower sections to make wider boards or tops, will require sash cramps to hold the joint together whilst the glue sets, photo 3. Along with the G-cramp they are the most essential holding aid, but the best-quality ones are expensive and come in a huge range of sizes, photo 4. 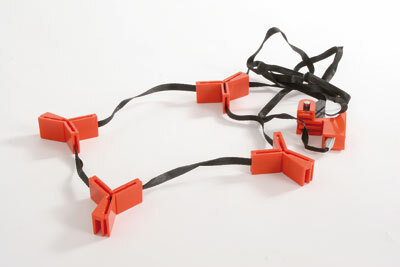 There's little difference in cost between the long ones and the short, but the maxim that "what will do a lot, will do a little" is not always the case with sash cramps, particularly if you are short of space. 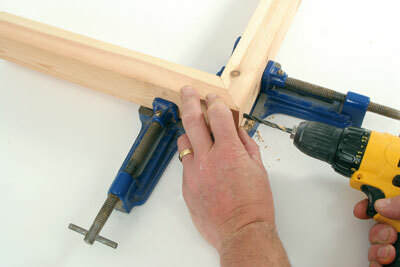 Long ones are often too cumbersome and unwieldy for small jobs, photo 5, so inevitably you will need a few shorter ones as well, but if you are gluing up the framework to a carcass then the long ones are essential. 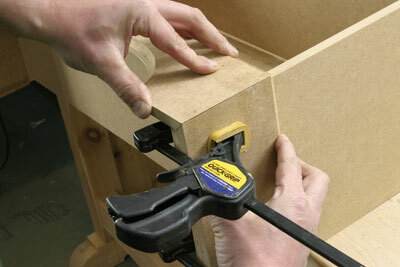 Extension bars allow you to make a short cramp longer, and can be taken off for those smaller jobs, photo 6. Go for quality here. 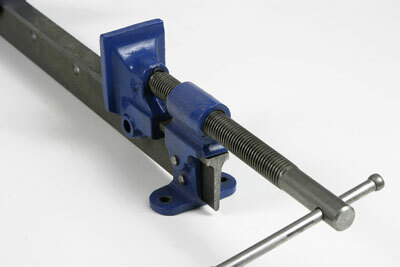 The bars need to be straight and true and the heads properly machined with a clean buttress thread that applies strong, even pressure when you tighten it up, photo 7. 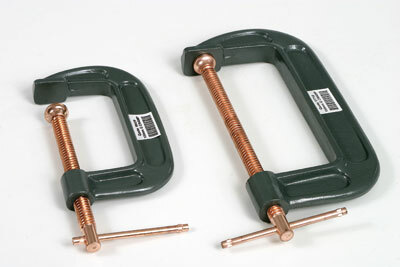 Cheap imported cramps usually have bent and twisted bars and a thread that is so coarse that it prevents proper tightening. 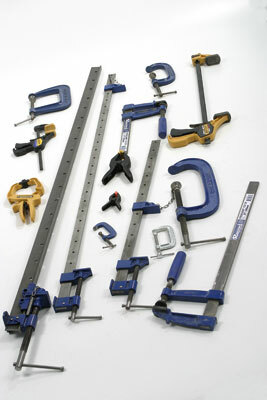 Not only will you use the cramps for gluing up, but for holding things together for trial assemblies, particularly on big jobs where you just don't have enough hands, photo 8. 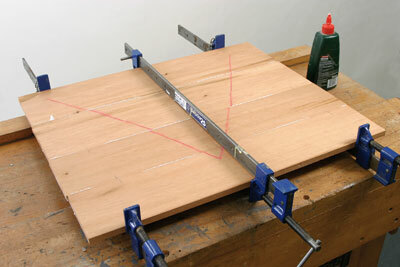 If the edges of the work are to be cleaned up after assembly, you can use the cramps as they are; however, the jaws will mark the surface, so if this matters, you will need to use packing strips to prevent any damage, photo 9. Initially I would advise buying a couple of 36in cramps with extension bars, then adding a couple of 24in and 48in cramps later. 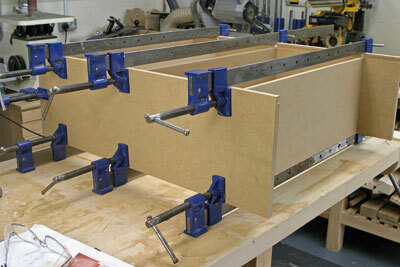 Panel jobs usually require clamps top and bottom to minimise any distortion and even simple assembly jobs will need plenty of cramps, so you will inevitably need more than you think, photo 10. 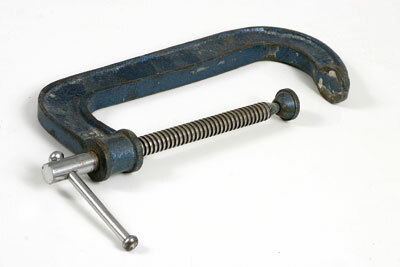 If you are involved with heavy work you might like to consider T-bar cramps, which are the ultimate, but at an equally ultimate price. 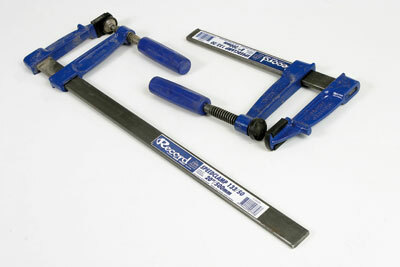 As the name suggests, these have a much more rigid T-section bar which is essential for large joinery jobs like doors or frames, photo 11. 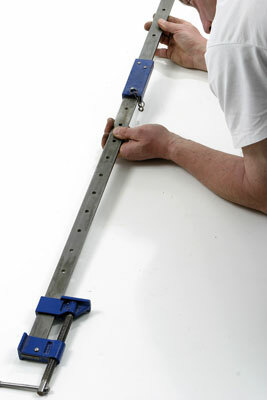 Again, extension bars are available and you can then reach something like 8-9ft, which should cover most jobs! 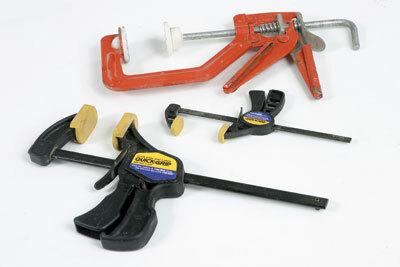 The G-cramp comes in a variety of sizes and weights, photo 12. Decent ones are also a bit pricey, but buy as many as you can afford as they will all get used and most jobs will need several, photo 13. 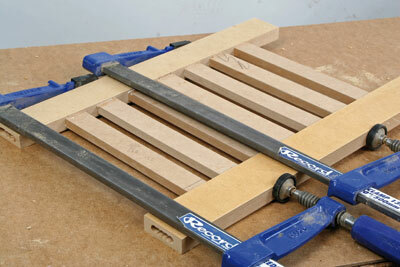 The 4 and 6in sizes are probably the most useful to start with, but consider adding some bigger ones when you can. Buying quality will again pay off because most of the very cheap versions are bent and stiff to operate. More importantly many don't close right up, so are useless for thinner jobs, photo 14; however, there is now a budget range which although lighter in weight than the conventional style, represents excellent quality and is considerably cheaper, photo 15. Variations on the standard G-cramp offer very useful but more specialised cramping. Deep-throated versions allow you to reach further in for less accessible applications, so a couple of this type is handy as you can use them for "normal" jobs as well, photo 16. 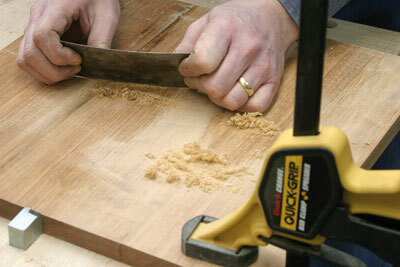 For lipping work, specially adapted edging cramps hold in two directions at once, photo 17. 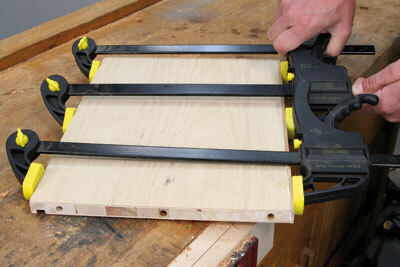 Heavier section work may be too big for even the biggest G-cramp. 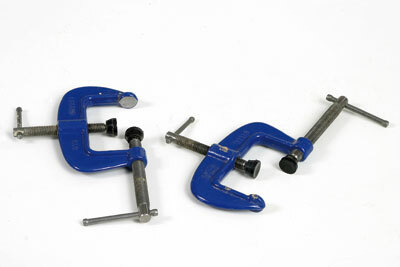 Here Speedclamps are probably the best answer as they have tremendous reach in both directions, photo 18; however, with all these handle-operated cramps only a limited force can be applied and they are very much a holding device rather than an aid for pulling joints together, photo 19. 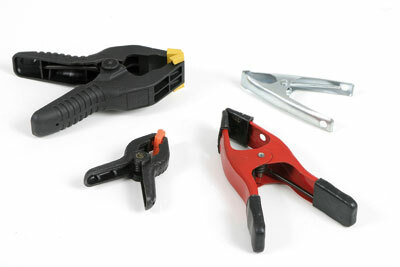 If you do decide to get some of these, look for versions that have soft pads over the jaws as these will save hours of frustrated fiddling about with scrap blocks that always drop off as you try to position the cramp. 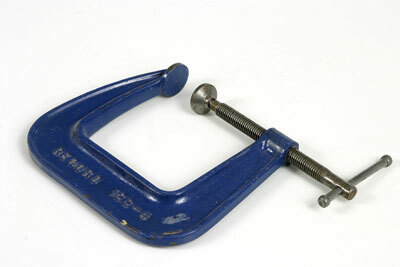 One sort of cramp I could not do without is the Quickgrip type, photo 20. 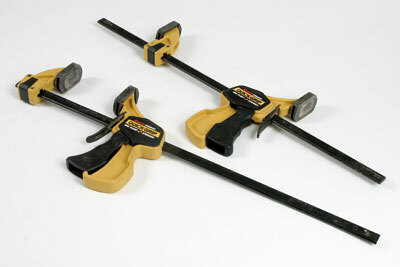 These are an absolute godsend, particularly if you work alone, in that they are operated single handedly, so you can hold the work and clamp it at the same time, photo 21. 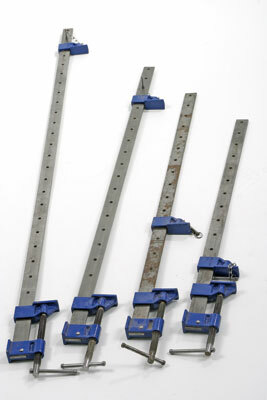 Sizes range from tiny little ones that are superb for model making right up to quite substantial affairs with removable jaws that can be turned around and used for pushing joints apart as well as clamping them, photo 22. 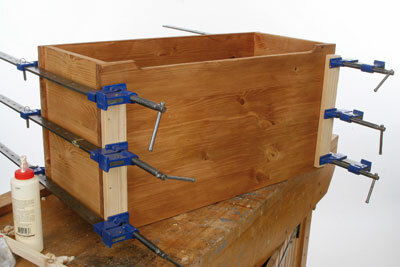 The jaws are padded as well so you don't have to worry about scrap blocks. 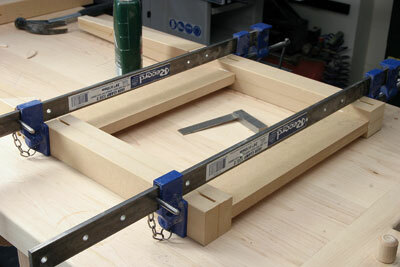 Their speed of operation makes them ideal for quickly clamping work to the bench, photo 23. Cheaper versions, although plasticky, are ideal for lighter applications like lipping work where you need quantity rather than quality, photo 24. Get some! 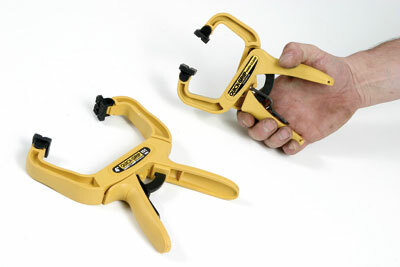 For quick, light clamping the plier type of grips is invaluable. 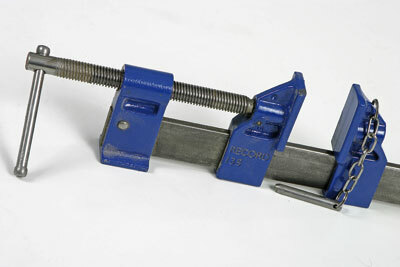 Again designed for single-handed use, these are the woodworking equivalent of the Mole grip so beloved by engineers, and just as easy to operate, photo 25. I have a couple that I use regularly for holding matching workpieces together so that they can be machined as one, photo 26, or for holding small mouldings, as you can apply just enough pressure to hold it in place but still have some freedom for positioning, photo 27. A further light squeeze then brings on the final pressure. It is the speed and simplicity of operation which makes them so effective, and they are relatively inexpensive as well. 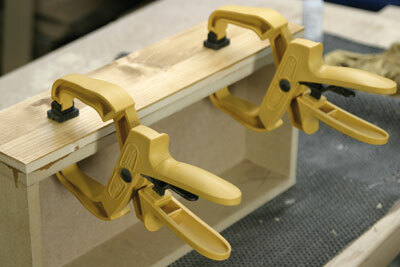 For the really light holding jobs buy a selection of spring clamps, photo 28. 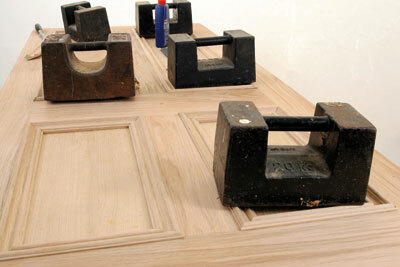 These are very cheap and so versatile, particularly if you are into restoration and need to hold little bits of moulding or veneer in place. A mixed pack of 10 will probably only cost a few pounds so will make up for those other dear purchases. 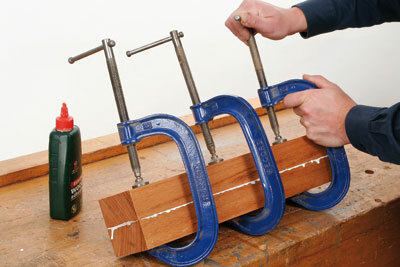 If you are into woodturning or picture framing you might consider one of the various types of band clamp, photo 29. 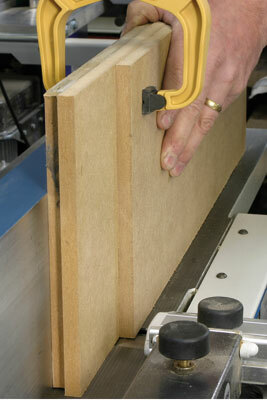 The other clamp I consider as a must is a mitre cramp, photo 30. These are expensive, but you can often get by with just one. 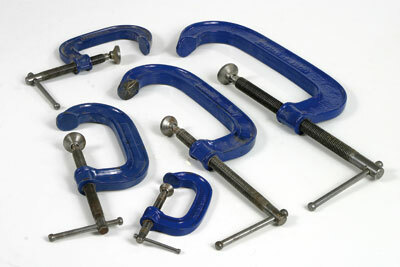 Finally, for those awkward holding jobs where no other clamp will reach, a selection of heavy weights will usually get you out of trouble, photo 31. Old imperial weights like these can often be bought for a song at car boot sales so if you see any, buy them - they are one of my most used pieces of workshop equipment. "Cramps can make or break a job, pulling it all together at the assembly stage and acting as a third hand when work holding"